In July 2013 Leo Blanco gave an astonishing solo recital at Sage Gateshead that was truly a virtuoso performance. The good news is that he's back in the UK with his Blue Lamp Quartet which comprises Blanco with Paul Towndrow (alto); Mario Caribe (bass) and Alyn Cosker (drums) plus award winning singer Christine Tobim. The not so good news is that the nearest he gets to Gateshead this time round is the Jazz Bar in Edinburgh. Venezuelan piano virtuoso Leo Blanco returns to the UK at the end of January for set of concerts that includes an appearance with his Blue Lamp Quartet at Glasgow’s Celtic Connections festival and a duo gig with Dublin-born singer Christine Tobin, who is the current Parliamentary Jazz Awards Singer of the Year, at the Vortex in London. Blanco made a big impression on his first full tour of the UK in the summer of 2013, selling out four of his eleven dates and earning rave reviews from The Guardian, Jazzwise and Jazz Journal for his rhapsodic and inventive solo piano playing. 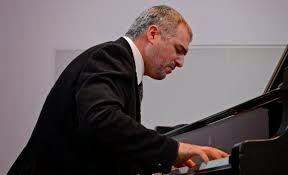 Following his London concert at the Forge in Camden, John Fordham of the Guardian was moved to describe Blanco as “a phenomenon” and Blanco’s latest album, Pianoforte, which was released to coincide with last summer’s UK visit was greeted as an “unalloyed triumph of invention” in Jazz Journal. Blanco’s gig at Celtic Connections on Sunday February 1 reunites the Venezuelan with three of Scotland’s finest musicians, the Brazilian-born bassist Mario Caribe, alto saxophonist Paul Towndrow, of horn quartet Brass Jaw, and the Scottish National Jazz Orchestra’s drumming powerhouse, Alyn Cosker, who formed the Blue Lamp Quartet with Blanco to thunderous acclaim and five-star reviews at Aberdeen Jazz Festival in 2007. A musician who particularly enjoys working with singers (he has recorded and performed with Grammy-winning vocalist Luciana Souza as well as featuring alongside Dave Liebman, Donny McCaslin and Lionel Loueke), Blanco was so impressed with Christine Tobin’s vocal quality and her recent, award-winning album of Leonard Cohen songs, A Thousand Kisses Deep, that he invited her to join him at the Vortex on Wednesday, February 4 in a programme of duets and solo piano pieces. He will also play with Caribe, Towndrow and Cosker at the Jazz Bar in Edinburgh on Friday, January 30.